Throughout the fall, organizers and leaders have diligently mounted a campaign focused on securing new police protocols and oversight that will ultimately lead to greater accountability for officers and the Chicago Police Department itself. Led by Organizing Director Shamar Hemphill and Green ReEntry organizer Nasir Blackwell, IMAN’s police accountability work sits at the intersection of larger efforts focused on criminal justice reform and dignified community building. The campaign aims to address law enforcement policies in all their breadth, focusing on issues from immigration status to stop-and-frisk encounters. IMAN has aligned with nearly a dozen other organizations across the city, representing a dynamic cross-section of active citizens and laying a firm foundation of unity. Partner organizations include: Communities United, Enlace, Target Area Development Corporation, UCCRO, SWOP, One Northside, Action Now and S.O.U.L. In November, dozens of Marquette Park residents convened at IMAN’s Youth & Arts Wellness Center for a critical “Community Conversation.” During the gathering, attendees spoke candidly about their experiences with local police and voiced their hopes for future improvements, while learning about the citywide campaign and ways to get connected to it. IMAN will continue to help lead the push for substantial police accountability measures in the city of Chicago. Interested in joining the campaign? Please contact Shamar Hemphill or Nasir Blackwell to learn more and to get involved. 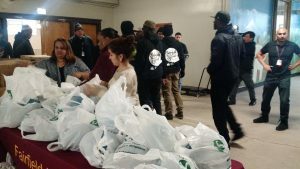 With helping hands from the Mohammed Webb Foundation, Sabeel Pantry, Fairfield Academy and IMAN, nearly 1000 turkeys were distributed to local families on Tuesday, November 22nd. As part of the 16th Annual Chicago Muslim Turkey Drive, staff, youth leaders and organizers united for the total team effort needed to make such a far-reaching initiative successful. Green ReEntry cohort members provided valuable support as well, unloading many pallets of halal, high-quality turkey throughout the day. IMAN’s participation in the Chicago Muslim Turkey Drive was not simply an isolated effort. Rather, the program is part and parcel of the tradition of grassroots work that IMAN is built on, symbolizing the best of what is possible when selfless citizens convene in order to galvanize their communities. 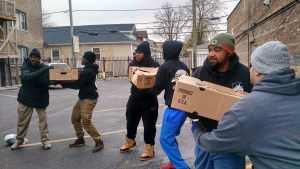 Spearheaded by Sabeel Pantry and longtime IMAN leader Jihad Shoshara, the Chicago Muslim Turkey Drive received high-profile news coverage from several noted local media outlets. 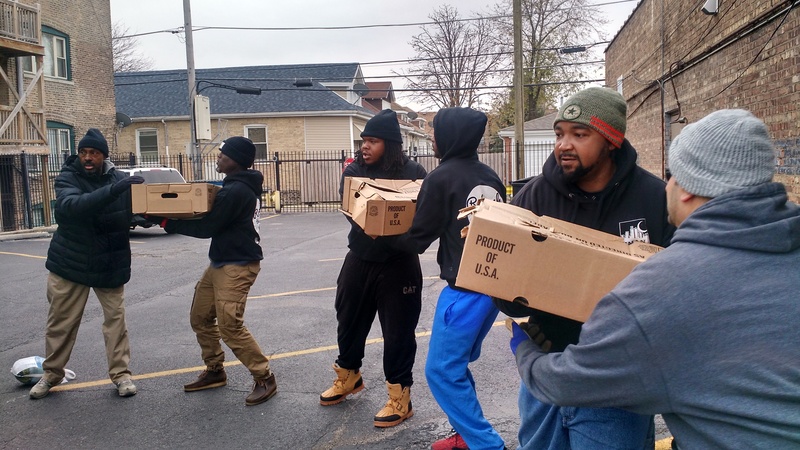 More importantly though, smiles beamed across the faces of hundreds of South Side residents that day as they picked up their turkeys. Such proactive outreach is a powerful reminder of the role that dignified, direct service plays in the betterment of our city. I am elated that IMAN was recently listed among seven organizations Changing The City For The Better by the renowned nationwide convener Chicago Ideas Week. Such a distinction is only possible with your prayers and support, and securing a table at IMAN’s Annual Dinner on Saturday, December 10th is an important affirmation of that support at this critical time. The Chicago Ideas Week recognition was also a powerful reminder during a difficult week for many in our larger community. In spite of any potential hardships resulting from the election, our collective mission must be to double down on the work of organizations like IMAN. As an African-American Muslim and daughter of a family that led early American Muslims through very turbulent times, I know that our community can not only withstand hardship but thrive in it. My father, the late Imam Warith Deen Muhammad (may God have mercy on him), once reminded Muslims of the era of Pearl Harbor and Japanese-American internment, when his community was called the “Black Japs.” The degradation of the Black community and the mischaracterization of Islam as a non-white religion, was undoubtedly linked to the stigmatizing and intimidation of the early American Muslim community. Instead of admitting defeat or falling into despair, those pioneers responded with love for the Creator, themselves and a creative vision for lasting, positive change. As a long standing IMAN board member, I take great comfort in knowing that my father saw and loved the spirit of hopeful resilience and vision manifested in IMAN’s many programs, campaigns and initiatives. Please join me and my family on Saturday, December 10th at the beautiful South Shore Cultural Center to ensure that work continues to flourish in Chicago, Atlanta and beyond. I have always taken great inspiration from the prophetic prayer beseeching the Creator to make us a source of Divine Light. I know these last few weeks have felt a little darker for many of us. Yet, at IMAN, we often talk about aspiring to be a light rather than just curse the darkness. My prayer is that you and your family can take solace in the fact that people like you have built IMAN over the last two decades to be a source of light and hope in the face of challenging times. For thousands of families from all walks of life that are direct recipients of our services, leaders in our organizing campaigns or attendees at our inspiring arts events, that’s exactly what IMAN has come to mean to them. There have been several renewed calls for coalition, alliance and community building with our brothers and sisters from black, brown and other communities over the past few weeks. I am encouraged by those calls. Yet, I also know that such work needs more than just impassioned calls at times of great anxiety; it also needs sustained commitments to support and grow that work at the deepest levels. In light of our current moment, I hope that you do all you can to ensure IMAN remains an illuminating source of inspiration by securing your table at this year’s Annual Dinner on Saturday, December 10th at the South Shore Cultural Center. As the legacy of Dr. King reminded us so poignantly this year, our journey to justice continues regardless of who is in office and how many decades have passed. We hope that you will be with us that night as we reflect and renew our commitment to that journey for the years to come.